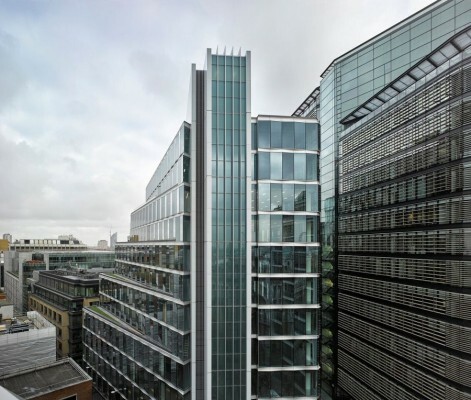 12 New Fetter Lane has completed. 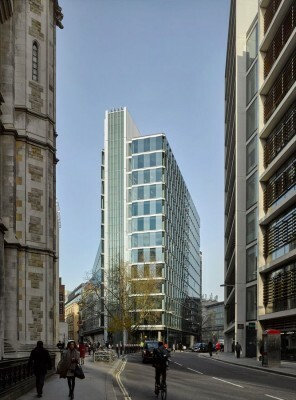 The new 15-storey office building makes a virtue out of a challenging triangular plot in London’s Midtown. 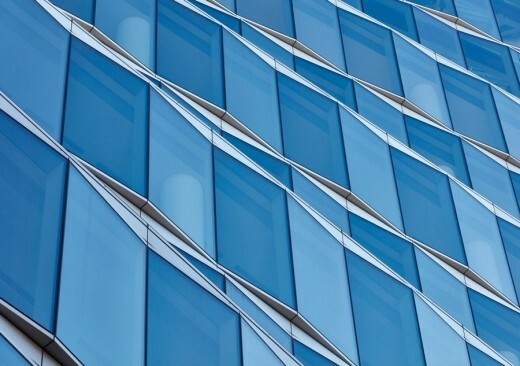 This striking scheme, designed by the collaborative architectural team of Doone Silver Architects and Flanagan Lawrence, occupies a triangular site bounded by Fetter Lane and New Fetter Lane. 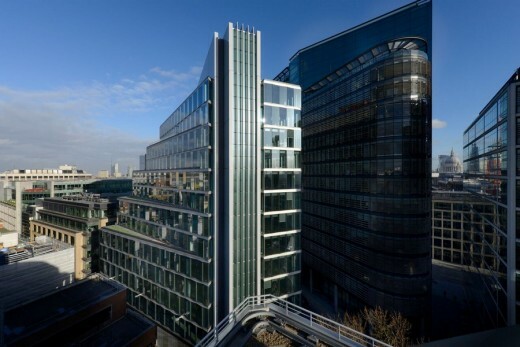 Its innovative, rotating stepped form responds to the low-rise Chancery Lane Conservation Area to the west and the higher-rise commercial developments of New Street Square to the east. The building’s slender vertical ‘hinge’ defines the meeting point of these two streets. 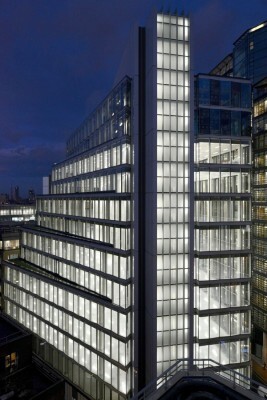 The scale change between West and East elevations is resolved by a cascade of double storey stepped terraces rotating around the southern vertical hinge – the hinge expressed by a translucent glazed staircase, filtering natural light during the day and glowing as a vertical white beacon at night. 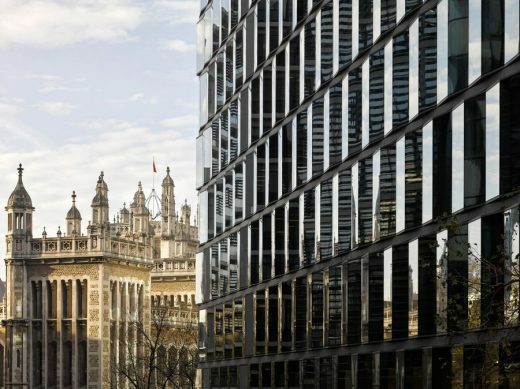 This feature creates a powerful focal point when approaching the building from Fleet Street, and the building is now a distinct landmark when viewed from the South. 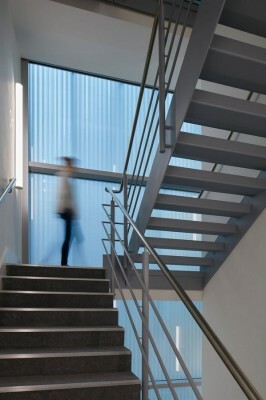 The external envelope of the building is composed almost entirely of glass. The core is clad in pale grey opaque glass vertical panels, whilst the principal clear glazing to the offices is expressed as a multi-faceted and reticulated surface. These diamond-cut facades generate multiple complex reflections, capturing light and constantly changing in both pattern and appearance throughout the day – a highly modelled façade that references the historic diamond dealing district of Hatton Garden immediately to the north. 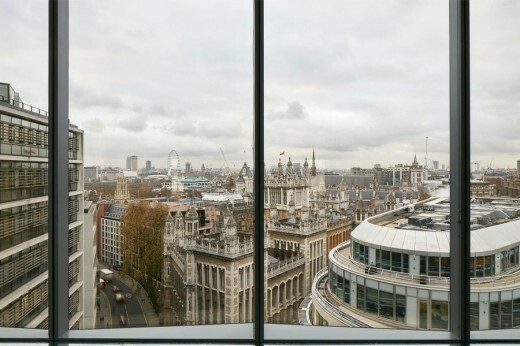 The prime quality office space within the building benefits from high levels of natural light, excellent external awareness and impressive views across London. The Northern vertical service core mirrors the Southern staircase, containing lifts, WCs, on-floor air handling plant and service risers. This core, containing the chillers and the telescopic building maintenance unit, then continues at roof level and is expressed as a single spine around which the whole building is organised. The ground floor of the building is set back, defining the different spaces and uses at street level. 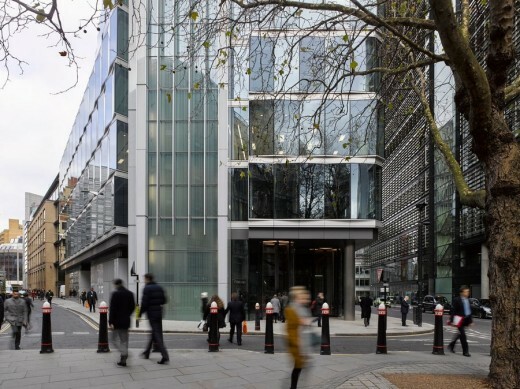 The first of these is the main entrance lobby that runs most of the length of the New Fetter Lane elevation – a single clear volume viewed through a full height and full width glass wall, consisting of gigantic glazed panels supported by almost invisible glass fins. Retail units add activity to the new urban park on Plough Place. The single basement level contains additional central plant space together with cycle parking, changing rooms with showers and building management accommodation. 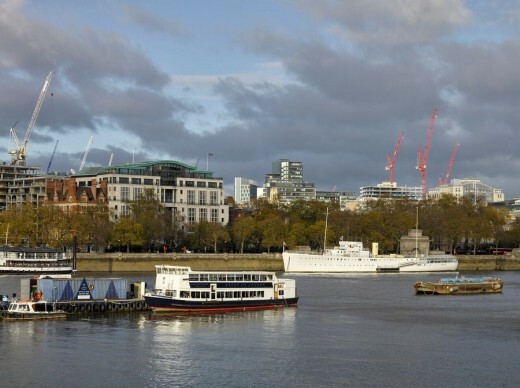 Environmental sustainability has also been a key factor throughout the development of the design. The building achieves a BREEAM ‘Excellent’ rating, offering a substantial reduction in CO2 emissions compared to current building regulations. 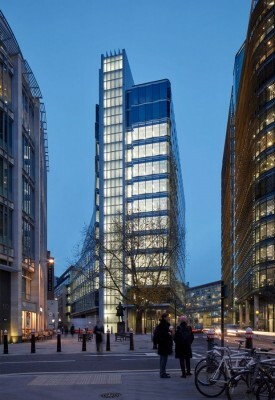 12 New Fetter Lane will be occupied by international law firm Bird & Bird, with fit-out completing in Summer 2016.